The healthcare scenario of Hatiya, an island Upazila on the southern Bangladesh, is changing fast. 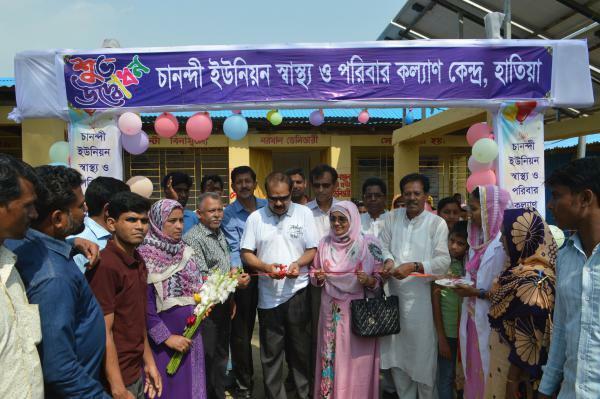 Over the last two years or so, six of the upazila’s nine union level health facilities have started offering 24/7 delivery services, the latest being Chanondi Union Health and Family Welfare Centre (UH&FWC) in Subarnachar Upazila in Noakhali. It promises a significant change in the lives of around one lac people of the area who had to travel long distances to avail emergency maternal and newborn health services. USAID’s MaMoni HSS project coordinated closely with the local government and Family Planning Department to upgrade the Chanondi UH&FWC into a 24/7 delivery centre. The project deployed a paramedic and supported construction of a dumping pit while the Union Parishad (UP) allocated budget for installing solar. The local Family Planning Department came forward to equip the facility with the necessary equipment so delivery services could be offered 24 hours a day. Several hundred people gathered at the Chanondi UH&FWC premises on 19 March, 2018 to take part in an event organized to mark the opening of round-the-clock normal delivery services. Md Mahbub Morshed, Chairman, Upazila Parishad, Hatiya, spoke as Chief Guest while A.K.M. Johirul Islam, Deputy Director, Family Planning, Noakhali District, addressed the event as a Special Guest. MA Jalil, former Chairman of Durgapur Union Parishad and a passionate advocate of strong local government engagement for the development of the union level health facility, recounted how Durgapur Union Parishad under his leadership transformed the UH&FWC. The facility now handles around 100 deliveries a month, a significantly high number for a union level health facility. Strengthening of the union level health facilities to improve the maternal and newborn health service is a major focus of USAID’s MaMoni HSS project. The strategy has led to the upgradation of more than a hundred UH&FWCs into 24/7 delivery services in the four MaMoni HSS districts, namely Noakhali, Lakshmipur, Habiganj and Jhalokathi, over the last couple of years.